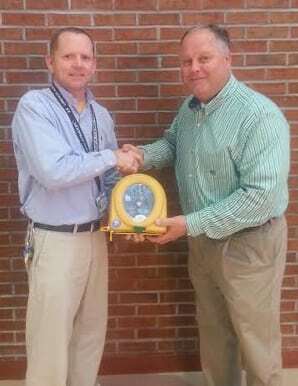 Trainer JP Hamilton (left) presents a HeartSine Automated External Defibrillator (AED) to Crisp County High School Principal, Rusty Sowell. After losing a staff member due to cardiac-related complications, Crisp County High School in Cordele, GA has received a HeartSine® Automated External Defibrillator (AED) in a grant program sponsored by Hopey’s Heart Foundation and supported by HeartSine Technologies. This lifesaving donation was made possible by an AED Grant Program sponsored by Hopey’s Heart Foundation that provides eligible participants with AED equipment for use during Sudden Cardiac Arrest (SCA), a condition in which the heart suddenly and unexpectedly stops beating. With 84 percent of SCA events occurring outside of the healthcare setting, including on school grounds or school buses, or during sporting events, it is imperative to have an AED on hand in the event of a cardiac emergency. Staff at Crisp County High School immediately began researching AED grant programs after the sudden loss of a staff member due to heart problems. “Our recent loss brought to our attention the current AEDs we have on campus and the need to have an additional one or two placed on school grounds,” says JP Hamilton, Athletic Trainer at Crisp County High School. Determined to further protect the heart safety of its 1,100 students and over 100 staff members, Crisp County High School applied to the AED Grant Program. The HeartSine AED will be an addition to the three currently located on campus and implemented as part of the school’s Emergency Action Plan. It will be placed near the gymnasium at the south end of the campus, within easy reach to students and staff. “I am very thankful to have the opportunity to protect the safety of organizations and schools across the country through Hopey’s Heart Foundation. Being an athlete who understands the importance of AEDs first-hand pushes me to continue to help in the fight against Sudden Cardiac Arrest,” says Tina Charles, WNBA player for the New York Liberty and Hopey’s Heart Foundation Founder. HeartSine and Hopey’s Heart Foundation congratulate Crisp County High School on their HeartSine samaritan® PAD 350P. In order to apply to the AED Grant Program, applicants are required to be a 501(c)(3) tax-exempt organization or a government entity and need to complete a 500-word application addressing their need for an AED. Since the Grant Program’s launch in 2013, Hopey’s Heart Foundation has placed 131 AED packages in 35 states across the U.S.